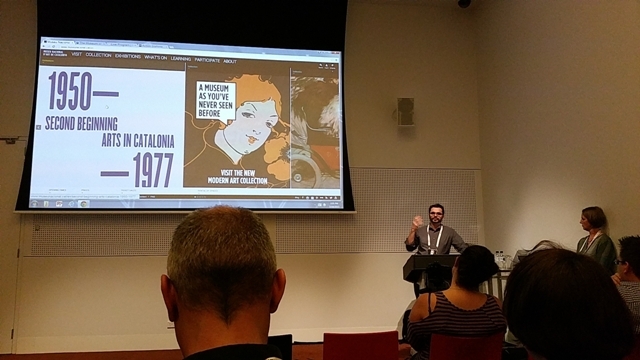 Connections and new learning was the intense activity during the edition of the Museums and the Web Asia 2015 held in October in Melbourne. Our museum participated by running a Hands-on Content Strategy Workshop and by presenting the website renovation. As we often do in this blog, we will try to sum up the most noteworthy elements. take the online offline: museums that are more active in digital are transitioning the other way round, from digital to physical. Digital media rich and interactive content can enrich what we have on the walls. I’d add that it is a two-way road. Museums have a lot of in-gallery information that’s can’t be found online. We should diversify our content and let users decide what to use (or not) and how, in any given context. Out of the many sessions, I’ll highlight also five. The opening keynote by Nick Honeysett, entitled “Witchcraft” in reference to the magical interpretive skills required today in museums. 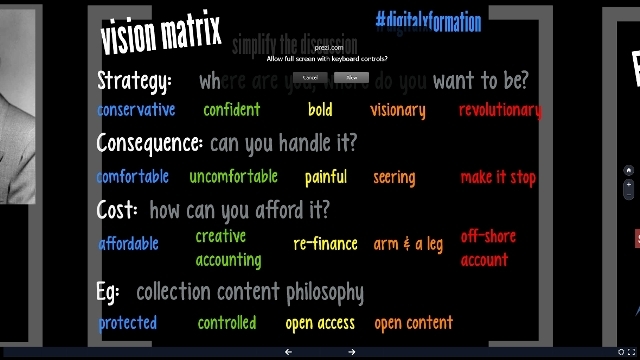 Witty and provocative, the presentation dealt with three topics: digital strategy, digital literacy and digital transformation. Central Idea: digital innovation and creativity should not be a department on the organisational chart, but part of every department. The presentation, a very visual Prezi, is available online. the digital dimension makes our content virtually accessible to all the world, and this is its great value, along with the fact of allowing a new and different experience. Catherine Devine, from the American Museum of Natural History, talked about the Visitor’s Journey, a very relevant way of reviewing what we offer, from the visitor’s perspective. The museum’s journey transcends time, channels, devices, place and context, since visitors expect a unified experience (omnichannel). You need a solid architecture, not to create a disjointed experience, and design for continuity, consistency and identity, so that the system recognizes the same person through different channels. 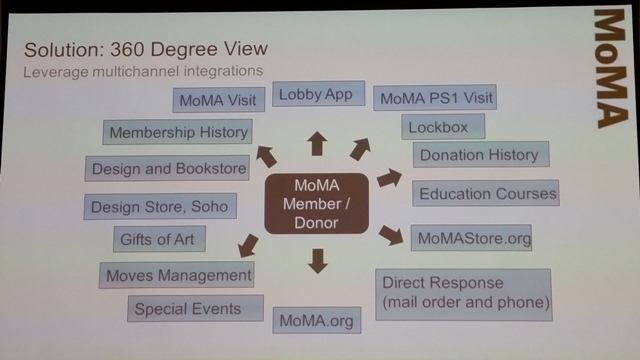 MoMA’s Chief Technology Officer, Diana Pan, presented the integrated CRM (Customer Relationship Management) of the museum’s membership and donors, more than 150 000 members. The challenge was how to track many types of constituents with multiple ways of interaction. From the aggregated information of all the collected data (visits, courses attended, annual renovations etc), they elaborate a dashboard and decisions are made. MoMA’s CRM is cloud-based and has a mobile solution. Among the lessons learned: data cleansing, training and cross-departments reporting are needed. All three of them are good and innovative projects. The analysis was made from the user’s point of view and his/her experience while interacting with the platform. She pointed out some of the difficulties and barriers that prevent achieving an optimal usability and to create more value. The moral: this digital setting is still so new and experimental that not even in the major museums, and with a large budget, is an optimum user experience ensured. More research is required as well as more involvement of the users in the preparation of the materials to whom they are aimed. Janet Carding, director of the Tasmanian Museum (until recently director of the ROM- Royal Ontario Museum in Toronto) and one of my favourite museum directors for her transformational vision of museums today and her communicative skills on social media. The current organisation in museums was discussed. Museums are transitioning from hierarchical into networked organisations, to have people working together effectively. Seb Chan, rocking again, said. “It’s not teaching people about technology but teaching them about the possibilities of technology”. It was also highlighted the risk of not doing things. Our museum gave a workshop on content strategy for museum professionals from museums of Australia, New Zealand, India, Singapore and Canada. This workshop is an evolution of the one we prepared together with Tijana Tasich for Museums and the Web in Chicago and MuseumNext in Geneva. The feedback of the workshop was very positive. Asked about topics that they would like more training on, they mentioned first of all research about users, and secondly writing for websites. We presented the renovation of the website in the Web Crit, a very useful initiative in which experts analyse websites which are presented voluntarily “to be judged”. I had already done so in a previous conference with the then recently renewed website of the Museu Picasso. Even though there are people who feel that exposing their website to a public judgement is not a very nice experience, the truth is that the experts do so in a very diplomatic way, and I consider it to be highly useful. You get relevant feedback by means of an express audit. In the case of the website of the Museu Nacional, the fact that it is very visual, very rich in contents and with consistent menu and behaviour, was praised. What was analysed in a harder way was the mobile version, which has some tech and navigational problems. We are very aware of this and we are working on it with the development company. Having this expert analysis reinforces our arguments for negotiating the improvements to be done. I wouldn’t like to finish without thanking the museums who opened their doors to the conference delegates, outside their opening times, and who offered receptions and meetings with their professionals: the National Gallery of Victoria, the Australian Centre for the Moving Image and the Melbourne Museum. 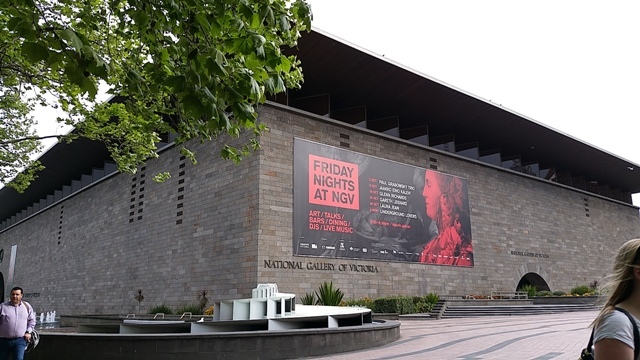 National Gallery of Victoria. On the left. A visual way of informing, in a passageway, about the new acquisitions. On the right, a last friendly message to the visitors before leaving the museum. 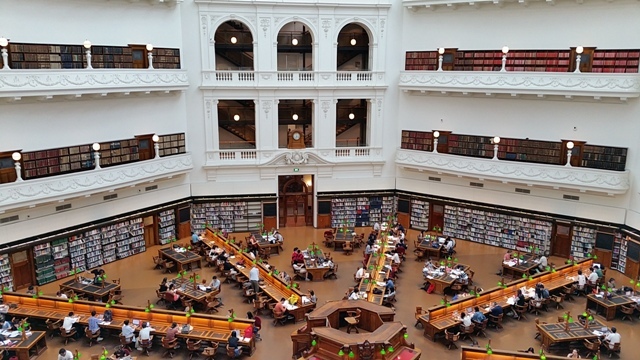 I would also like to highlight and pass on my gratitude to the magnificent State Library of Victoria where we were able to see live how they worked on the digitisation of documents of the library. They have a digitising committee made up of collections staff, website team and management. This committee meets once a month to review proposals and decide digitising priorities. And now, just to note that the number of staff in some of the museums commented on is light years away from our reality. With the meagre resources in the museums of our country for digital themes, both economic and in terms of the provision of staff, the truth is that it seems to be a very healthy exercise to positively rate the digital advances achieved. As Michael Parry said on twitter: “The most interactions we have as an institution are online. And yet are we staffed properly to support this?” One thing we have in common: the conviction that the digital dimension – of the society and of the museums- will continue to grow, and we need to be active and attentive so as to explore the best ways of networking and to offer a better experience to the user.